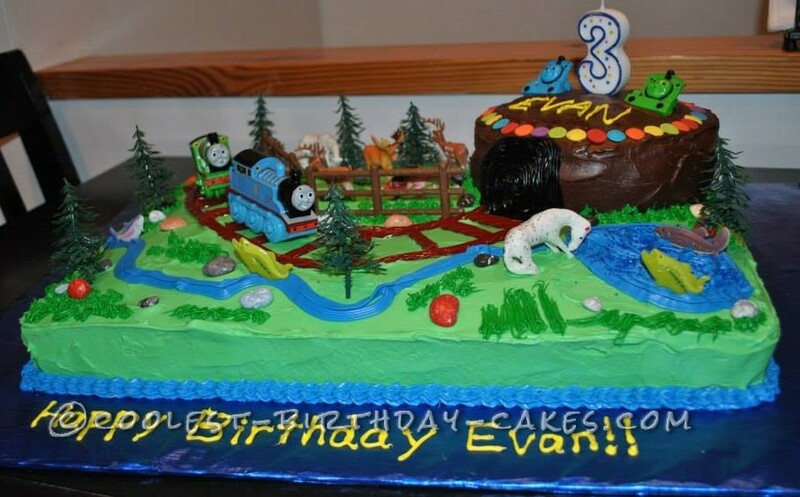 I made this Thomas the Train Railroad cake for my nephew’s 3rd birthday since no one else in my family bakes and no one could afford a large enough Thomas the Train cake either. I am still new to making cakes (only made about 30 so far) but this was not difficult. All I did was bake and ice a half sheet cake using three boxes of cake mix and baking it on 325 degrees for 45 minutes. Then I decorated with different sized Twizzlers as the train tracks, lots of different colored sprinkles, added animals, trees and little fences and made a river and lake out of icing and sprinkles then I placed eatable rocks all around the cake (all items I found at my local cake supply store). I made the green grass with a multi-hole icing tip (see how technical I am). Then there is the mountain. I baked a round cake using 1 cake box and a 9 inch round cake pan, trimmed down and iced the cake and used black icing to draw a tunnel on the side of the cake. Of course I used good old fashioned chocolate icing for the mountain itself. It took about 3 hours for the whole thing but I go pretty slow because I am still newer to this and am super picky about how the cakes look. Everyone thought it was pretty cool and I am really really excited to start on more cakes. Luckily I ended up buying a size too big for the sheet and cake box because when I was done I had really no room to write Happy Birthday to my nephew on the cake and I really did not want to write it on there after all my hard work anyway so I was able to use the extra room on the cake sheet to write it.